TOP South Yorkshire legal experts Wosskow Brown have chosen leading video production and media agency Shift Studios to put them in the corporate spotlight. Wosskow Brown, based in Attercliffe, Sheffield, S Yorks, and one of the leading law firms in the region, with a national remit, have teamed up with Shift Studios to handle their corporate imagery and high-tech presentation needs. Simon, founder and executive producer at Shift, is using the latest video technology and editing suites to help reposition the image of the 150-year old law firm. Simon, from Chesterfield, started Shift Studios in 2008 as an audio recording studio, but soon realised the potential to factor in the hi-tech video production side of the agency at the start of this year after some time spent in Australia. His company uses the latest production techniques to discuss, formulate and then tailor a bespoke production schedule with dynamic effect and is already winning clients from across South Yorkshire and the rest of the UK. WB chose Simon after being impressed with his video presentation style and his attention to detail, and above all Shift Studios' web and social media marketing savvy. “Anyone will tell you that using video is a great promotional tool. However, what makes Shift Studios different is that we develop a campaign and pay attention to detail at every stage of the process. “We specialise in creating dynamic, engaging content that demands the attention of people in a way that aims to attracts an audience who love watching your material. It's about finding a niche angle into any company that makes the video dimension entertaining, credible and shareable - and ultimately memorable. “Coupled with the immense potential of the web and the online networks, the reach of our material has the advantage of being both stimulating and global, but with a niche focus. “At present, we're working on promoting WB primarily through video and web content; developing stimulating solutions both in video and trying to change the way in which people look at solicitors. We are working hard to remove any old fashioned 'stuffy' stereotypes with regards to the profession. “Simon and Shift Studios have been exemplary both in the presentation and delivery of the image of our practice and have an innate understanding of our company and its focus. “Wosskow Brown already has a formidable reputation not just in its home county of South Yorkshire but also beyond, and Shift Studios' first class work has more than enhanced that wide ranging remit in a both an intelligent and eye-catching way. “Our aim as a company is to make Wosskow Brown the legal name of choice throughout Yorkshire and beyond and to present it as an accessible household name; and also as the first choice destination for a broad portfolio of legal advice. “Simon and Shift Studios' ambitions are similar to ours in that they operate both locally and in the wider field, without losing that feel for understanding the core values of what makes a business – and its clients 'tick'. Shift Studios and Wosskow Brown are playing a key role in promoting sports in the region. In a new move, WB it aiming to back 50 regional sporting ambassadors by the start of the London 2012 games. The company's special sports discount scheme allows for up to 25% of fees to be donated to a sporting team, athlete or club, at a local level. Shift Studios also has close links with sport, having recently used its video skills to promote South Yorkshire speedway star Ashley Birks. And thanks to the superior skills of Shift Studios, speedway will be the prime time focus of a forthcoming programme on Sky Sports 3. 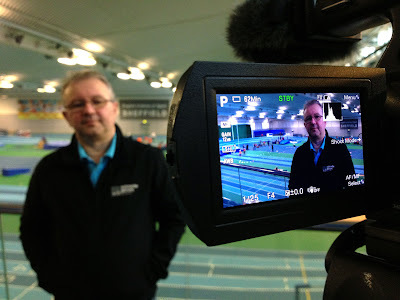 Simon and his team's work, in association with Venture Video, impressed tv producers enough to give the programme - entitled Sports Unlimited - a featured scheduled tv slot, rather than a lesser showing as had been planned. Shift's skills will be on show on Sky Sports 3 on November 29 and 30 at 7pm. ñ Wosskow Brown Solicitors in Sheffield is one of the leading firms of solicitors in South Yorkshire, with roots going back over 150 years. It has developed a wide range of high quality legal services, delivered to individuals and businesses in a professional and personal manner by highly qualified and approachable staff. It provides a local service for clients in our region, but services are also delivered all around the country. ñ More info about WB's sports scheme can be found at www.wosskowbrown.co.uk.